Canadian Daily Deals: What Does the Starbucks Unicorn Frappuccino Taste Like? 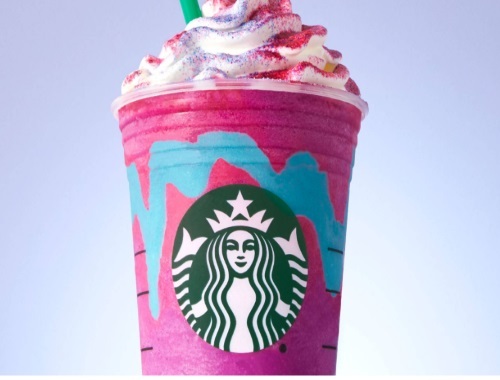 Starbucks is bringing out a Unicorn Frappuccino for a limited time! You've probably seen snaps of this all over Instagram. It's available at participating Starbucks stores in Canada and the US from April 19-23, 2017. The Unicorn Frappuccino blended crème is made with a dusting of pink topping blended into a crème Frappuccino with mango syrup and layered with a pleasantly sour blue drizzle, It is finished with vanilla whipped cream and a sprinkle of sweet pink and sour blue topping! I found an interesting article on The Star that paints a different story about how this looks and tastes - "When a news release identifies a drink’s component parts by its colours, rather than its flavours — well, that’s a pretty telling detail. And sure enough, it is vibrant and fun. But what flavour is “pink?” Pink is the flavour of Lisa Frank trapper keepers and strawberry milk. What does sour blue powder taste like? Like Jolly Ranchers, and shame. I guess there’s some mango in there, though it’s overshadowed by a mouth-puckering sour flavour and immediately forgotten in the aftermath of a long-lasting, tongue-coating Robitussin aftertaste." I haven't tried it yet, it looks pretty but not something that I'd probably like the taste of, let us know if you have on our Facebook Page.